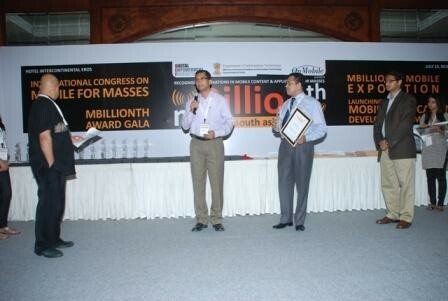 Business Express awarded in m-Billion, India | Business Automation Ltd.
by Digital Empowerment Foundation, India in association with Department of Information Technology, Ministry of Communication & Information Technology, Government of India. This year, 35 projects have been awarded out of total nomination of 250 from different South Asian countries. 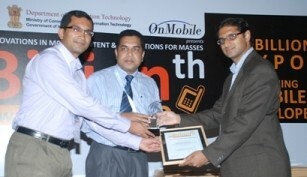 Business Express received the award in the category m Business & Commerce. The award giving ceremony was held at Hotel Intercontinental Eros, New Delhi on 23rd July, 2010 in presence of Ms. Agatha K. Sangma, Minister of State for Rural Development, India. The ceremony was also attended by Mr. Sunil Kanti Bose, Secretary, Ministry of Post & Telecommunication, Bangladesh Government, Dr. Prof. Peter Bruck, Chairman, WSA Mobile Content, Austria, Mr. Siva Ramamurthy, Managing Director, Intel South Asia, Mr. Reshan Dewapura, COO, ICTA, Sri Lanka. Business Express is a solution from Business Automation for sales force automation, which can also be used for market data collection and survey. The solution is working in different FMCG in Bangladesh.